These were my goals for Bloggiesta, with what I actually accomplished in blue. Besides the stuff on the list, I also started exploring statistics plugins, which wasn’t on the list but is something I need. However, as you can see, I did not cross off that many items from my list. Here’s why: On Sunday, Mr. Bookwyrm finally had time to work on my computer, which had issues. He fixed the problems (hardware-related), but I wasn’t able to do much work on Sunday. On Monday, we ended up tackling the basement instead of the blog. I can’t complain, because we got a whole section of the basement decluttered and reorganized (it was starting to look like an episode of Hoarders down there!). Now I can physically get to two bookcases that I couldn’t access for the last few months – YAY! I suppose I could count that as blog-related – especially since one of them is a TBR bookcase! LOL. But it didn’t leave me with a lot of time to work on blog cleanup. 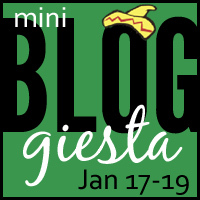 Not too bad for my first Mini-Bloggiesta, all things considered. I’m pleased with what I did get done, and my plan is to carry on with what’s left of those goals into the coming week. Final note: I don’t know what to do about Goodreads. Customer Support told me last week to post my problem on the Goodreads Developer forums, but no one there is answering me. The UBB plugin is blocked from automatically cross-posting my reviews to Goodreads because apparently Goodreads doesn’t like my IP address – not my domain name but the actual servers — and is therefore blocking it. Grrrr. Goodreads is infamous for their lack of response; you just may be SOOL, though I hope not. You did pretty well overall, that was an ambitious list. Thank you, Bea! Yeah, I’m trying to resign myself to not getting anywhere with Goodreads on the API thing. ETA Finally got a response from Goodreads, and Ashley is working with them to see if they can clear it up. Fingers crossed! Wow, that is annoying about Goodreads…hope it gets sorted! You accomplished a lot! Thanks, Laurel! We’re working on it. Ughhh I didn’t get to participate in this this time around. I needed to though that’s for sure. It was my first time, and I didn’t get as much done as I thought I would.